Saturday January 5th 1884 A little more moderate than yesterday. Mother was in town and was busy about the work all day. 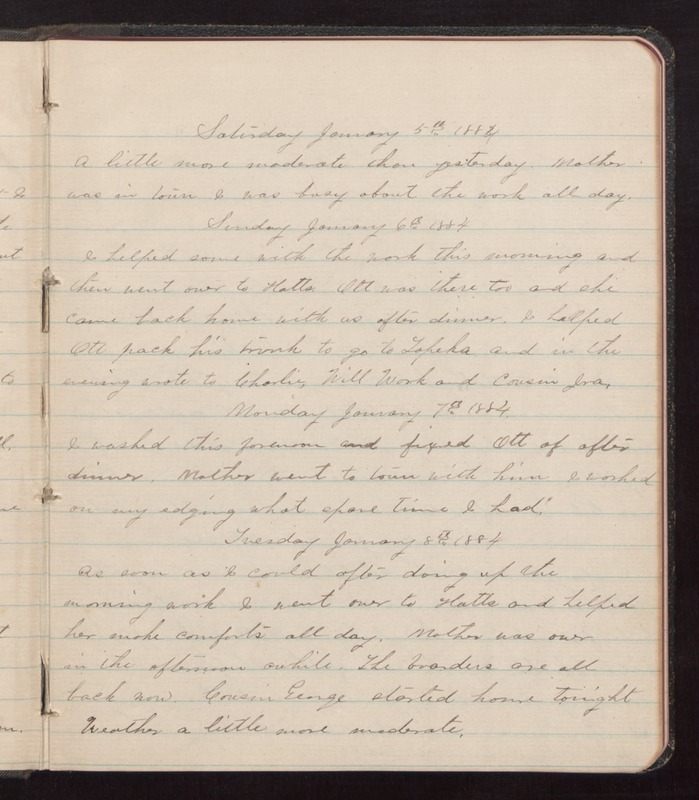 Sunday January 6th 1884 I helped some with the work this forenoon and then went over to Hatt's, Ott was there too and she came back home with us after dinner. I helped Ott pack his trunk to go to Topeka and in the evening wrote to Charlie, Will Work and Cousin Ira. Monday January 7th 1884 I washed this forenoon and fixed Ott of after dinner. Mother went to town with him I worked on my edging what spare time I had. Tuesday January 8th 1884 As soon as I could after doing up the forenoon work I went over to Hatts and helped her make comforts all day. Mother was over in the afternoon awhile. The boarders are all back and Cousin George started home tonight. Weather a little more moderate.